Have you ever been on a culinary quest that lasted for years? Trying to find an elusive recipe that you tasted once or enjoyed as a child, trying to recreate that recipe but not getting it quite right year after year? Giving up, then recommitting, looking at old cookbooks, hoping for divine intervention and, when all else fails, searching the internet? Such was my quest for my grandmother’s apple cake. 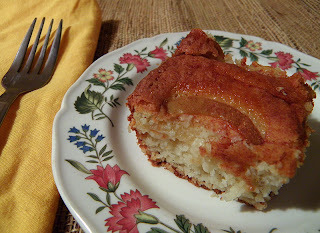 With a vivid flavor and texture in mind, and recipes in hand, I made many delicious apple cakes (and one notable failure) that weren’t anything like Gram’s. Until two days ago, when a hole in the space-time continuum to 1968 opened up and I saw the light. How fortunate that this happened before the dinner party. 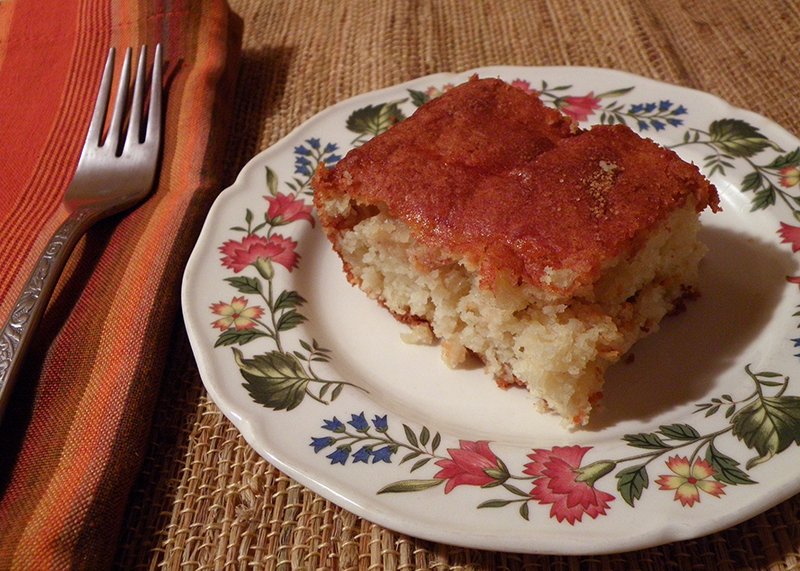 In the late 1960s my family made a recipe called Jewish Coffee Cake. The origins of this recipe are obscure, and although one aunt claimed it as her own, it seems more likely that it was once published in a women’s magazine. Even more mysterious, my husband sees nothing Jewish about it, although his Jewish father and grandmother made all sorts of traditional treats. Its most distinguishing ingredient is a cup of sour cream. This combined with baking soda gives the cake its characteristic light texture. I substituted Greek (thick) yogurt because I had on hand. This yogurt was very sour and made the cake even lighter. I tweaked the coffee cake recipe a bit and paired it with thin apple wedges set into the batter skin-side-up, like Gram did. Voilà, an apple cake that’s darn close to Gram’s. 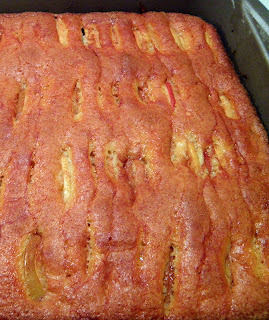 Gram's Apple Cake At Last! Be sure to use a large enough pan. The idea is to have the cake rise just above the thin wedges of apple that you stand up vertically in the batter, so you can still see the apples after it bakes. Unlike muffins, which get tough when overmixed, cakes benefit from thorough mixing-in of each ingredient. An electric mixer is the easiest way to do this. Hand-mixed cakes require quite a bit of muscle and commitment for optimum texture. Cut the apples as thinly as possible, between ¼” and 1/8” thick. I like to use at least three varieties of apples for extra flavor. Fit as many apples as you can into the batter (details for placing apples into batter so cake rises evenly are included in recipe). 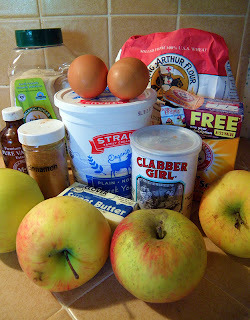 You might not quite use the entire amount of apples, but you don’t want to run out mid-process. As you work to insert the apples, the cake rises noticeably, and for best results you’ll want to get it into the oven as quickly as possible. My grandmother traditionally served this cake with whipped cream, which compliments it beautifully. It’s also very moist and enjoyable on its own. Gram seemed genuinely surprised every time someone wanted a second piece of this cake, which was most of the time. 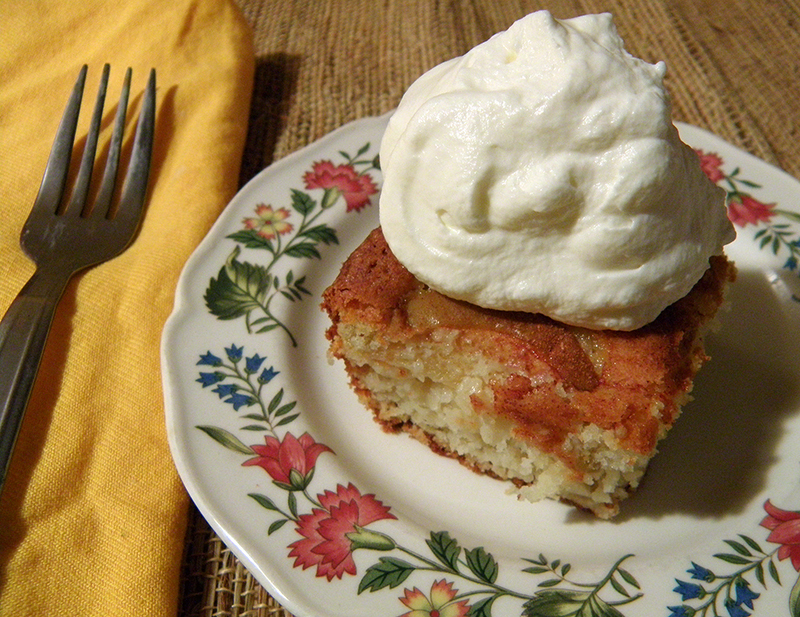 Although she wasn’t the most celebrated baker in the family (a title reserved for the aunt who claimed to have invented Jewish Coffee Cake), her apple cake appeared frequently at the table due to popular demand. Note that there are too many servings for most parties, which means plenty of leftovers for visiting grandkids, or husbands in search of midnight snacks. Enjoy! Toss thinly sliced apples with 1-2 tablespoons freshly squeezed lemon juice. Use the greater quantity if apples are all sweet. Set apples aside. Combine 1½ tbsp. sugar with 1½ tsp. cinnamon. Set topping aside. Preheat oven to 350 degrees F. Grease and flour a 9” x 13” baking pan. Whisk together flour, baking soda, baking powder, and salt. Set dry ingredients aside. Cream together soft butter and 1½ cups sugar until light and fluffy. Beat in eggs, one at a time, until completely smooth, using an electric mixer. Beat in yogurt, ¼ cup milk, and vanilla with electric mixer until smooth. Beat in dry ingredients with electric mixer until smooth and well blended. Mixture should be thick, but not too sticky to spread into pan. If too thick, stir in additional milk 1 tablespoon at a time until batter can be spread into pan. Turn batter into prepared pan and spread out evenly with spoonula or spatula. Push apples all the way down into batter in rows with skin side up (straight side down). 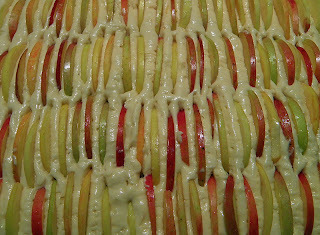 Batter will compress up through the rows of apples, so to ensure even compressing, start with a row in the middle and one on each end. 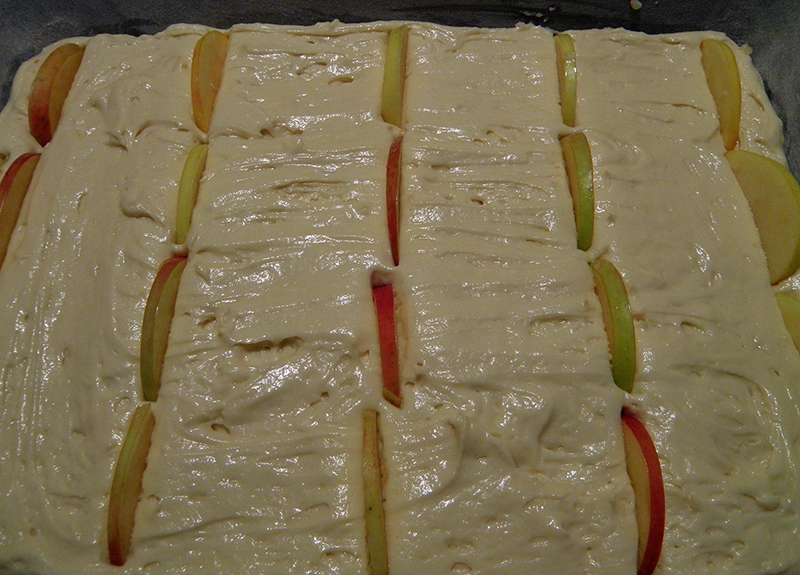 Then subdivide each section in half by making a row of apples through the middle of the section. Continue subdividing sections with rows of apples until all apples are used and/or there is too little space to add more apples. Sprinkle top evenly with cinnamon sugar topping. Bake at 350 degrees F. for about 30 minutes, until golden brown and toothpick inserted comes out clean. Don’t overbake! Cool. Serve with whipped cream, if desired.